A cruise ship offers not only an impressive location, but also the service and attention to detail that are needed to make your wedding unforgettable. Some of the most memorable cruises that I have experienced as a Carnival Cruise Lines representative have been the Indian weddings. We recently had the pleasure of welcoming the Mahtani/Dodani families onboard the Carnival Imagination 3 day cruise from Miami with their guests from many different countries. On a bright sunny day, Tanaz was getting ready to have lunch with Gustad – a normal weekend affair the duo had been following for more than two years now. She was used to long comforting walks and spending quality time with Gustad in Central Park followed by feasts. However something inside her said this was special. What could possibly be the surprise element? Oh yes! He must have planned an exciting birthday bash as it is Januray 25, Gustad’s birthday – she concluded. The two met and proceeded on a walk across the park to reach the restaurant where lunch awaited them. But in the vicinity of the famous Bow Bridge of Central Park, Gustad did something Tanaz will cherish for the rest of her life. He suddenly went down on one knee, confessed his love and proposed “Tanaz, will you marry me?” Though not prepared for such a pleasant surprise from the birthday boy himself, she couldn’t resist the offer and reverted with a quick “yes” accepting the beautiful ring from Gustad, which was a symbol of his love and commitment for her, elevating their friendship to new heights. As Gustad had already convinced both families, with Tanaz’s ‘yes’ what remained was a spectacular Parsi wedding. 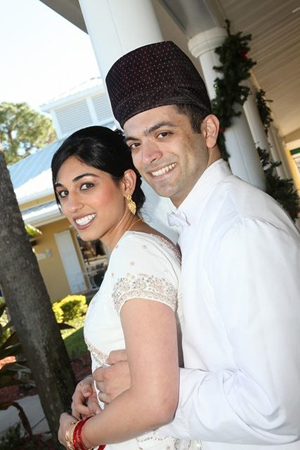 Donning the hat of an experienced wedding planner, Tanaz’s mother Yasmine began the preparations. The Wyndham Orlando Resort-Convention Center on International Drive was picked for the auspicious occasion as the venue offered a separate entrance for privacy so that guests could skip the crowd in the general lobby. 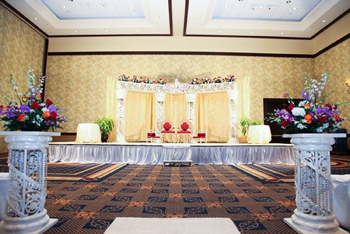 The ballroom offered a perfect floor for the celebration. The couple’s love for nature and Central Park’s landscapes gave the theme color for the day. And the world went green and gold for the Parsi love birds. 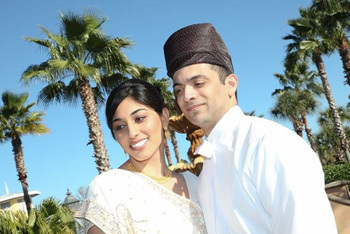 As a traditional Parsi wedding, four days before the wedding Madavsaro ceremony was held. Brothers of the bride and groom planted two fruit trees, broke coconut and offered prayers. As a symbol of fertility, they sowed egg, with pure white cloth, gold and silver beads, paan, supari, kharak, bada, and rock candy with a small container of dahi kunku. Adami – the gifts exchanging ceremony between the two families was held on the wedding eve. The wedding stage was decorated in open Athena style with four pillars, hanging lights and flowers. Adorning the transoms was Asho Farohar. There were six aisles to match the stage, all beautifully lined-up with flower arrangements and lights. The chairs wore white scroll design covers with sash. Palloo really did a great job. For reception, the bridal table was decorated with cascading flowers. The backdrop was crystal curtains with LED Uplights. The cake table was decorated with fabric and votive candles and the cake centerpiece was set in tall bubble vase filled with water gems. The bride’s bouquet had red roses with white pearl decoration while the groom’s bouquet was a bunch of red roses. Red freedom and circus roses, baum color dendrobium orchids, orane astermaria, purple and pink stock, leather leaf, lily grass, and purple lizi marcia brought in the perfect décor. The groom’s niece, the flower girl of the evening carried rose petals in a basket. 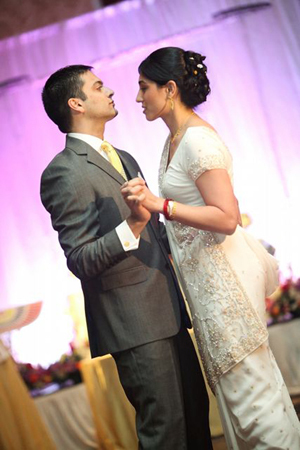 The bride’s sari was white and had gold designs and netting. The jewelry was gold. Tanaz stylishly went for her hair up. Her makeup was also along the same lines, soft and elegant. The men from both the families wore dugli (traditional Parsi dress) for the ceremony. The groom wore a feta, a black old-fashioned hat and carried a bouquet in one hand and coconut in the other. Over the arm swung a traditional shawl. The two groom’s men also wore the dugli but with small red velvet caps. These clothes were all made in India. The ceremony started with affirmations and commitments from Gustad and Tanaz. The mutual consent of the couple was asked, not once, but thrice and then the Mobed blessed the couple with showers of rice and rose petals. The bride and groom were each led and welcomed separately into the hall with Achhoo Michhoo – the good luck wishing ceremony – wherein both families separately welcomed the new family member. Following was the traditional Ara Antar – the union ceremony where Tanaz and Gustad sat facing each other with a cloth held between them. They held their right hand in a clasp under the screen and rice in their left hand. The Mobeds recited the prayers seven times while passing cotton thread around Tanaz and Gustad seven times, enclosing the couple in a circle. As the prayers were over, the cloth was dropped and the couple raced on throwing rice on each other. As the tradition says that the first one to throw rice would be more dominating, Tanaz -the undisputed winner- had reasons to beam. Thereafter the Ashirwad was bestowed upon the bride and the groom. The ceremony ended with the exchange of wedding rings. DJ Firoz was roped in to make the mood for the evening. He played the music pre-selected by the couple for the ceremony. 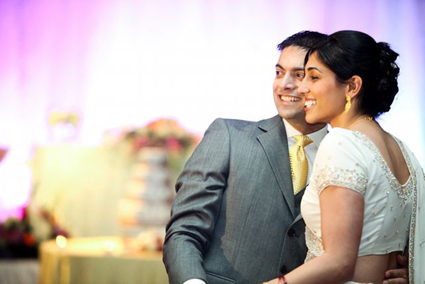 The bride walked the aisle with the background instrumental track of Hum Tum. The groom preferred walking to an English song instead. They picked a simple cake with a unique fun topper. It was a pair of monkeys dressed up for their wedding under a palm tree. The couple saw it online and got it made for the event. They did a bit of research and found someone in NYC who makes them out of clay. The cake was a blend of Marble Chocó Bavarian, Straw Chocó Bavarian, Butter cream marble and Chocó Bavarian. Syvlette was great as well. Good luck Buddha was given to all in a gold organza bag, placed at each dinner setting. Let your mom plan the wedding. She won’t let you down.